Have you ever tried making a pizza pasta salad? It’s delicious! And so simple to modify based on the crowd that you’re feeding. We used a mixture of garlic-stuffed olives and black olives, which we sliced ourselves. Then, we added some (super cute!) mini pepperoni for extra flavor. Don’t like olives? Leave ‘em out! Have a vegetarian in the family? Skip the pepperoni and double up on the tomatoes or bell peppers. Allow us to suggest some other ingredients you may want to try: Artichoke hearts, onions, grilled chicken, pepperoncini…just go for whatever tickles your fancy! Seasoning the salad with quality grated Parmesan and red pepper flakes really boosts the pizza flavor—so good! Bring a large pot of salted water to a boil over high heat and add tortellini. Cook approximately 6 minutes or 3–4 minutes less than package instructions recommend. You want to cook the pasta but allow the tortellini to remain firm in the salad. Drain completely then transfer tortellini to a large salad bowl. Add Italian dressing, tossing to coat the pasta and prevent sticking. Refrigerate 1 hour, stirring occasionally until tortellini is cool. Add tomatoes, bell pepper, olives, pepperoni and diced mozzarella then toss to coat in dressing. Add any additional pizza toppings you desire. If necessary, add a bit more dressing. Season to taste with salt and pepper or better yet, use a bit of grated Parmesan cheese and red pepper flakes to season the salad as you would a slice of pizza. Serve chilled and enjoy! 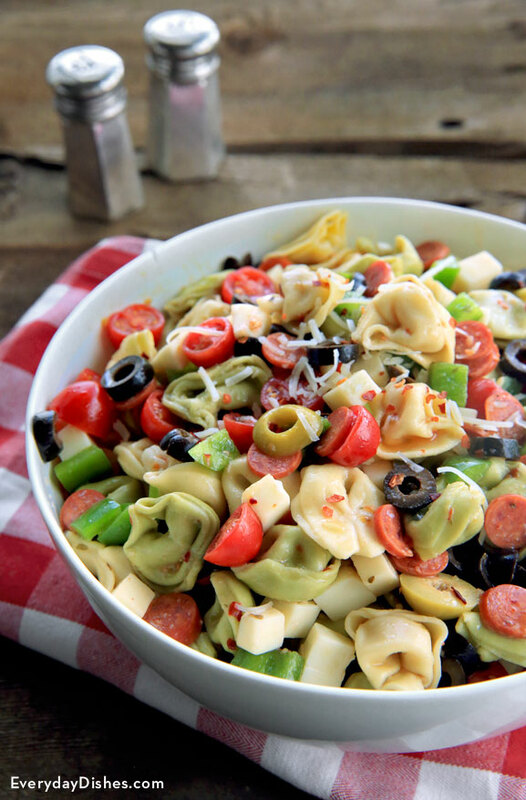 It is so easy to customize this pizza pasta salad to your family’s taste!